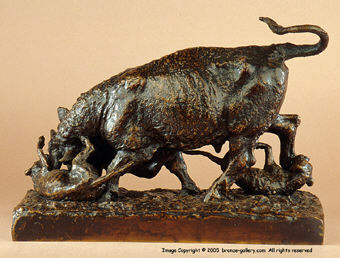 A fine and rare 19th century model of a Bull trampling two Bulldogs. Bull baiting was a common sport in the early 1800s and the dogs used for this had to be tough and agile. These Bull and Terrier crossed dogs were the forbearers of the modern pit bull. 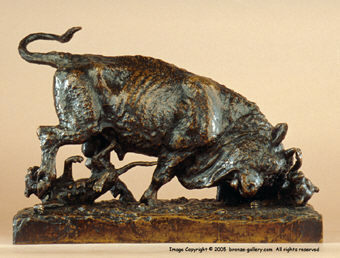 Fratin did several sculptures of these early Bulldogs and they must have been a popular breed at the time. This rare bronze is a sharp well detailed cast with a rich brown patina.